Julie Ertz will be at the center of the action as the United States women’s national soccer team plays in Concacaf’s World Cup qualifying tournament this month. 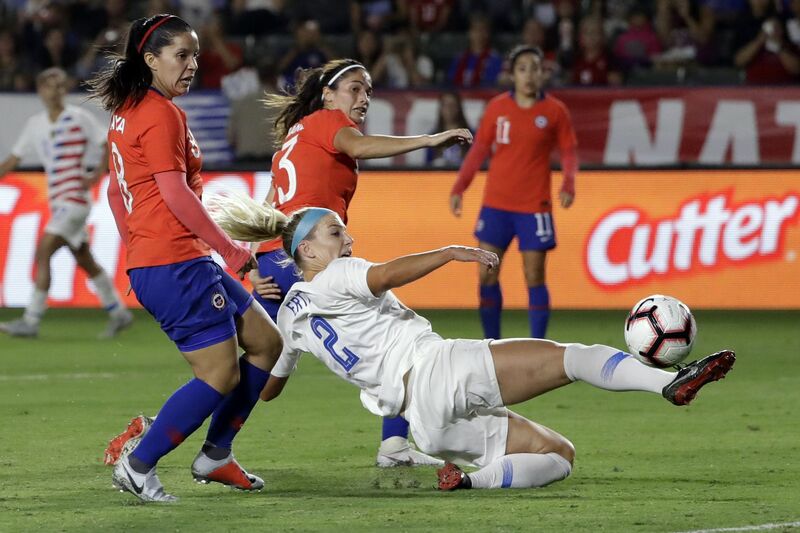 As the U.S. women's soccer team heads into Concacaf's 2019 Women's World Cup qualifying tournament this week, Julie Ertz insists she isn't thinking ahead. She insists her mind isn't drifting toward France, which will host next year's spectacle. Or the win-and-clinch-a-berth semifinal in the qualifying tournament. Right now, Ertz's mind is only on Thursday's Group A stage opener against Mexico (7:30 p.m., Fox Sports 2 and Univision Deportes). It will be the U.S. team's first game since the 2016 Olympics that has real stakes. Panama and Trinidad & Tobago are also in the group. "We really don't talk about games ahead," she said. "We don't want to get in that mindset, because then they become trap games." Ertz hasn't had much time to look ahead. After her Chicago Red Stars lost in the NWSL playoffs to eventual-champion North Carolina Courage, she was home for only a few days before leaving for U.S. training camp. For the team's dominance in women's soccer, it has been only eight years since it famously tripped in World Cup qualifying. The U.S. lost to Mexico in the semifinals, then needed to win the third-place game and a home-and-away playoff to reach the 2011 tournament. Veterans including Carli Lloyd and Megan Rapinoe have taught the new generation how things can go wrong. "They share those experiences to help the younger ones [know] that these tournaments are very important," Ertz said. "This is the first goal to the ultimate goal." The qualifying tournament might see the return of the steely midfield partnership of Ertz and Sam Mewis. They have played well together since the Olympics, but Mewis has missed some games this year because of injuries. Now, they're both healthy and in form. "Sam is a phenomenal player," Ertz said. "She can really control the tempo of a game, which is huge. … And then, obviously, her threat finishing outside the box." There's also Lindsey Horan, a 24-year-old playmaker who won the NWSL's MVP award this year. She can score in a variety of ways, is a great passer, and plays tenacious defense. "The way she sees the game, and the creativity that she has, and good feet skills, it really is fun to watch and be on her team," Ertz said. Combine a midfield of Ertz, Mewis, and Horan with a front line of Rapinoe, Alex Morgan, and Tobin Heath, and the U.S. has an attacking force that almost no opponent can stop. There's also great depth in the player pool, led by Lloyd, Rose Lavelle, and Mallory Pugh. "That's the beauty of this team," Ertz said. "Every training session, every practice, every drill is competitive. It makes it so much fun, and it makes you so confident as a team." The U.S. will play its group stage games at WakeMed Soccer Park in Cary, N.C., the Courage's home. Click here for the U.S. team's roster. Group B — Canada, Costa Rica, Jamaica, and Cuba — will play at H-E-B Park in Edinburg, Texas. (Outside observers expected Mexico to be in that group, but the luck of the draw went the other way.) Canada is favored to win that group. Costa Rica features Sky Blue FC forward Raquel Rodríguez, who led Penn State to the 2015 national championship. The semifinals, championship game, and third-place game will be played at Toyota Stadium in Frisco, Texas, home of FC Dallas and the soon-to-open National Soccer Hall of Fame. The winners of the semifinals and the third-place game qualify for the World Cup; the loser of the third-place game will play a home-and-away playoff against Argentina in November. Games will be televised on Fox Sports 1 and Fox Sports 2 and streamed on the network's website and apps. Because FS2 isn't in many homes, games on that channel — including the U.S. games against Mexico and Trinidad — will be available on Fox's streaming platform for all cable and satellite subscribers who get FS1. Union play-by-play man JP Dellacamera will call the U.S. games. Univision Deportes will have Spanish-language coverage of some games, and the network's website will stream a few others. The full schedule is below. Note that Fox's channel assignments may change because of the baseball playoffs.